With the rise of designer retail collaborations, it was about time shoe stores got a piece of the discount action. ALDO Rise is devoted to bringing cutting edge accessory designs to the masses, and their 2012 warm weather collection includes gorgeous heels by Libertine, Preen, and others. JW Anderson designed five unique pieces for the ALDO collection, focusing on nautical themes and couture details. One red, white, and blue strappy sandal features chic exposed stitching near the toe, and has a heel and ankle strap adorned with black feathers. Other closed-toe designs are fit for the country club with saddle and white leather, but include a mix of black and navy blue color-blocking that is far too stylish for the standard yachting crowd. Libertine only designed two shoes for ALDO, but they are must-haves. If you favor the label’s Anglo-streetwear attitude then you’ll love the chunky, black and white stripped Allor wedge. Or, opt for a more feminine design like the T-strap, stacked heel that goes for $155. Preen‘s five installments are true to the brand’s fashionista following. We’re obsessed with this printed, pixilated design, while the black and white version is still a stunner. Each design features the minimalist square heel and slight divot, which is a wearable interpretation of the heal-less shoe trend. Each design retails for less than $200, and the line also features a two-toned stiletto designed by Mark Fast available in four different Spring color combinations. While several designs are currently sold exclusively on Asos.com, the limited edition designs hot ALDO stores nationwide on March 8th. 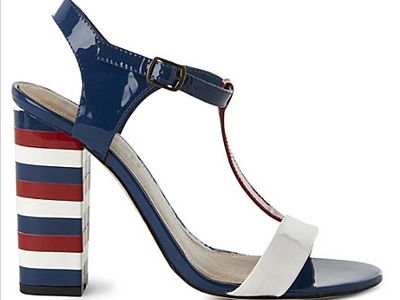 Will you be snagging these designer collaborations from ALDO?